This post is the first in a series. The topic? How to use your tax return to start a business at home. Why am I talking about this? 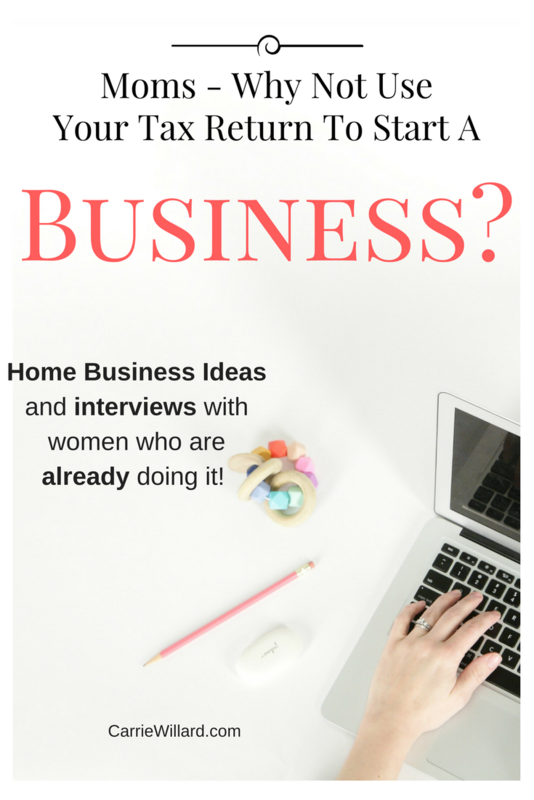 Why Use Your Tax Return To Start a Business at Home? As I have written about before, economic dependence is dangerous. A home business allows a woman to create an income stream that can hedge her family financially in case of disability, death, or divorce. Even if those bad outcomes don’t happen, most families these days find that in order to save, invest and avoid debt, they need a second income in the household. Studies show that most mothers prefer part-time work. A home business allows a mom to remain her kids’ primary caregiver. In addition, research shows that moms are simply happier when they have something of their own that isn’t related to household duties and childcare (source). A cottage business can be that “thing” that allows a woman to utilize her talents and strengths, while improving her family’s financial situation. This isn’t to diminish motherhood or family life in any way. But let’s face it, no woman has ever received a merit badge for putting a shine on the bathroom floor! So that’s the “Why” of starting a home business. That’s easy. It’s the “How” that’s the hard part. There is a ton of misinformation available online. When one goes to search for home-business ideas, you’re likely to turn up thousands of questionable ideas that are either illegal or a total waste of time. As an example of the latter, I never recommend taking surveys online for money. I don’t want you to earn pennies. Many bloggers recommend these companies because they’re paid hefty commissions to do so, but I value your time more than that! My goal with this series is to share real stories of women who are making real money with their chosen home business. Each of the women I interviewed I know either personally, or from networking online in private forums. Each of them is earning a very solid part-time or in some cases, full-time income. One of them does her business alongside her husband and supports a very large family. I’m sharing a variety of business ideas. Because contrary to what some people will tell you (even some of the women I interviewed – and I respectfully disagree! ), every home business is not for every person. We all have unique talents. Although I’m a blogger, I know that blogging is not for everyone. A pet-minding business is not for everyone. Direct sales is not for everyone. Amazon FBA is not for everyone. But hopefully you’ll find an idea in the next few weeks that will either be a good fit for you personally or will spark your creativity for something that will. One last thought on the “Why” of starting a home business. (I’m not an accountant, and you would definitely want to speak to a CPA!) A home business may have tax advantages for you. The reason I’m posting this series now is because, if you’re like most Americans, you’re about to receive a tax refund. It’s easy to blow that tax refund on something fun since it feels like “free money”. Instead of spending it, why not use your tax return to start a business at home that will also offer tax benefits and income next year? My husband and I are self-employed. Since we must use our home for work, we enjoy a lot of deductions; even a percentage of our utilities, including our internet connection, is deductible. Most if not all of the money you may spend this year starting a home business will be 100% legally deductible. Speak to your accountant! Enjoy! And if you have any questions, please leave them in the comments. Each one goes to my email inbox and I can answer it privately if you wish. Amazon FBA Business – how this couple supports a very large family from home with the Fulfilled by Amazon program. LipSense business – make money slingin’ this long-wearing, patented lip color product. You’ve really opened my eyes to wanting to make my own money, even though I’ve always wanted to be a stay at home mom, because I just don’t know what could happen to my husband. I remember Catherine Marshall when her husband died had no means of income…so she started writing! This year however, my husband and I are planning on using our tax return for a vacation but maybe next year I can put some towards my blog! Pet-sitting with Rover sounds like a great idea! I use them to find sitters for my pups all of the time and have found a lot of great people on there. Using money from your tax return to start a business is a great idea. It is a way to invest without diving into your savings right away. With a well thought out business plan and the gusto to pursue your dreams using that tax return just might be the best investment you can make. It’s a great idea to use your tax return to start a home business. I’ve recently started blogging myself because my husband of 24 years who is the sole income for the family filed for divorce! I know that it will take a while to build but at least it’s a direction towards a new life for me and my kids. Such a great idea! This is the first year we won’t get a tax return, but if we were getting one, I would definitely invest in my business and I am glad you are encouraging others to do that too! Really smart idea for stay-at-home parents! So much smarter than spending a tax return check on fleeting purchases. Great article, thanks for sharing! That’s a cool idea – to invest a tax refund into a micro-biz. Easy for most, b/c most biz models don’t require too much (if any) start-up. I’m enjoying this series Carrie! Before Babies I taught piano and violin from home. I’ve been out of it for 7 years because of my husband’s work schedule and no one to babysit said babies. But you’ve really motivated me to get back to teaching after we move this spring. Even if I only have 4 students for a while, at least that’s something, right? It’s so true about us SAH mom’s needing something else. I’ve seen first hand how difficult it can be when a woman devotes her entire self to her children. Even if she is fine financially, the emotional ramifications are severe. I’m looking forward to your blogging post! I’ve thought of getting back to it some more, but there are so many blogs out there now. Same with etsy- the market is saturated! The emotional ramifications – yes, you’re so right. I know there are tons of blogs (and Etsy shops), but nobody has your unique voice and talent. I loved reading your blog and I know others do too! Thanks Emily! It was taken at my oldest son’s graduation party. That’s tough Wendy, but all too common. This is one of the things that motivates me to tell women about what opportunities they can create for themselves. Especially since alimony is mostly a thing of the past.